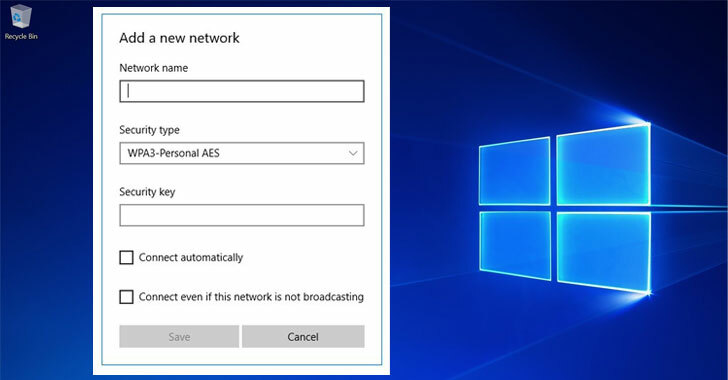 Windows 10 users don't have to wait much longer for the support of latest WPA3 Wi-Fi security standard, a new blog post from Microsoft apparently revealed. The third version of Wi-Fi Protected Access, in-short WPA3, is the next generation of the wireless security protocol that has been designed to make it harder for attackers to hack WiFi password. WPA3 was officially launched earlier this year, but the new WiFi security standard won't arrive overnight. Most device manufacturers could take months to get their new routers and networking devices certified by the Wi-Fi Alliance to support WPA3. Meanwhile, technology providers have already started working on software and firmware updates to support the new WPA3 standard, including Microsoft. 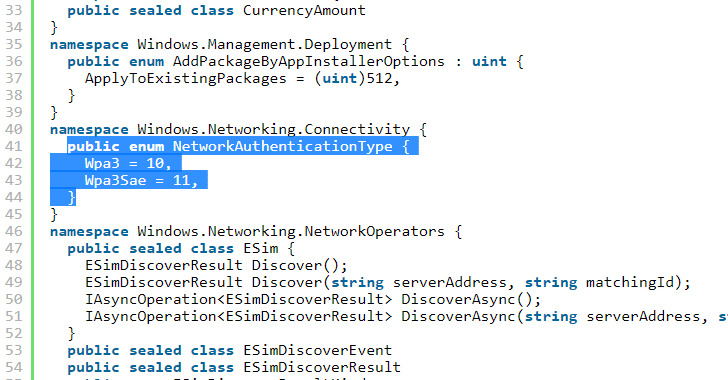 Though Microsoft hasn't yet officially announced WPA3 support for its Windows 10 operating system, new APIs introduced in the newly released Windows 10 SDK Preview build 18272, as marked in the screenshot below, indicates that Windows users would soon be getting support for the new protocol. WPA3-Personal leverages Simultaneous Authentication of Equals (SAE), a secure key establishment protocol between devices, to prevents attackers from decrypting old captured traffic even if they learn the password of a network. Windows 10 Software Development Kit (SDK) is a collection of headers, libraries, metadata, and tools from Microsoft to help Windows application developers build apps for Windows 10 platform. The SDK build 18272 supports the newly released Windows 10 Insider Preview Build 18277 (also known as 19H1) that has been designed to let developers and enthusiasts get early access to upcoming features and improvements, and share their feedback with the company. Besides this, Tim Cappalli, an engineer at Aruba Security, in a tweet claimed that he also spotted WPA3-Personal (SAE) available in the Windows 10 Insider build 18252.100 while manually configuring a wireless network. Another Windows user confirmed the WPA3-Personal availability in the latest Insider build version but also mentioned that it's not currently working as intended. Both frontend and API availabilities indicate that Microsoft is actively working on a stable version of Windows 10 operating system with WPA3 support. Last month Wi-Fi Alliance also announced the next version of WiFi standard, called 802.11ax (WiFi 6), along with a simpler naming scheme that aims to make it easier for users to recognize which WiFi version their devices support and run, helping them to keep their devices up-to-date with the latest advanced WiFi capabilities.